There’s a good chance you’re reading this after getting a whopper of a heating bill. If so, the last thing you’re in the mood for is spending more money. 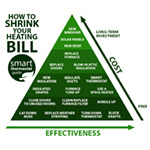 Good news for you: some of the best ways to lower your heating bill are also the cheapest! Lowering your heating bill doesn’t require solar panels or living like a caveman: check out the bottom of our pyramid for free (and almost-free) ways to save money on your next heating bill. Every Fahrenheit degree that you drop your thermostat (for the duration of the heating season) knocks about 1-3% off your heating bill. In Celsius, that’s closer to a 10% savings for a single degree. Of course, your actual savings depends on your climate (the harsher the climate, the bigger the potential savings) and other factors, such as your furnace’s efficiency and how good your home is at retaining heat). No matter which way you slice it, keeping your home at a lower temperature is less energy spent and more savings kept in your pocket. What’s a good set of temperatures to aim for? We here at Smart Thermostat Guide keep the thermostat at 66 °F (19 °C) when we’re home and drop it to 55 °F (12.7 °C) when we’re at work during the day and while we sleep at night. That’s a bit chilly, I agree – we bundle up good and we use a space heater to keep our home office much warmer, which is where we spend the majority of our time at home anyway. Insulating yourself is way cheaper than heating the entire house. Put on a thermal hoodie, a pair of thick slippers, and wrap a blanket around yourself if you aren’t moving around much. These simple adjustments will make a lower house temperature much more tolerable and shrink your heating bill in the process. The average North American home is 2300 sq feet – but are you actually using all that space? It’s much cheaper to heat 1700 sq feet than 2300, so if moving’s not in the cards you can fake it by closing the heating vents and shutting the doors to those unused rooms. Voila – less space to heat! Your furnace has to work harder with a dirty filter in place. This wastes money, wears out your furnace, and increases the likelihood that your local furnace repair shop will make a cool $200 off you when your furnace gives out at an inopportune time, since dirty air filters are the primary cause of furnace failures. Most households should replace their furnace filter every 4-6 weeks in the heating season. A humble rug (or several) goes a long way to making the floor feel less icy – an absolute must if your living space is over a garage, carport, or open air crawlspace. Rugs also help trap heat inside your home where it belongs, instead of leaking through the floor and into the outdoors. Replacing your weatherstripping is a DIY-friendly weekend project that helps slow the loss of heat through cracks around your windows and outside doors. Common sources of drafts are crawlspace doors, attic doors, ill-fitting windows, open chimney flues, and front door thresholds that are set too low. Locate and plug drafts to make your home warmer instantly – and stop expensive heated air from leaking out. An under-the-door draft stopper can work wonders. Shop Home Depot for draft stoppers. Here are some upgrades between $75 and $300 that can make a huge difference in your heating bill. PS: Did you do all the stuff in the free list? Many of the free fixes are just as effective as these suggestions, so combine them for amazing savings. Hanging heavy drapes takes a bit of work, but if you’re diligent about opening them during the day and closing the drapes as the sun sets you can trap some of that daytime heat inside your home. I’ve always used insulated curtains – they do wonders for keeping the bedroom dark on summer mornings and seem to help keep window chill contained. The effectiveness of this upgrade depends on what you’ve already got. But if your house is say, 30+ years old, there’s a good chance your in-wall, attic, crawlspace, or basement insulation isn’t as good as it could be. Easy insulation improvement: look for any pieces that have fallen down, and put them back into position with duct tape. Heated air travels through ducts to get from your furnace to your vents, so if your duct insulation is lacking you could be losing a significant amount of your nice heated air this way. Getting your furnace checked out and serviced by a professional every couple of years helps ensure that it is running at peak performance. A furnace tune-up usually costs less than $150 and can save you on heating bills and reduce the odds of an unpleasant breakdown. Yes, it takes energy to run a space heater – but it takes a lot less energy to heat one room to a toasty temperature than it does to heat the whole house. We’ve used the “heat one room” technique for years – it’s fantastic. 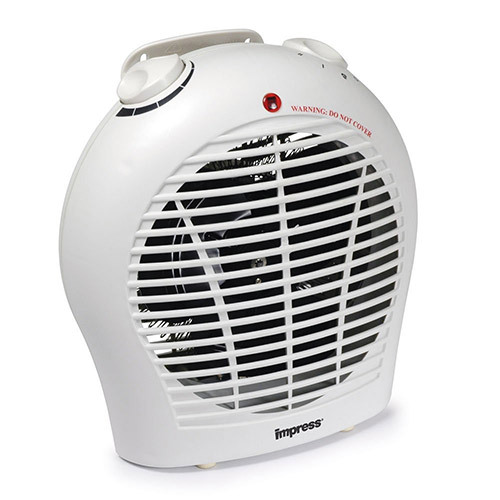 The Impress 1500-watt Space Heater is Amazon’s best-selling space heater. 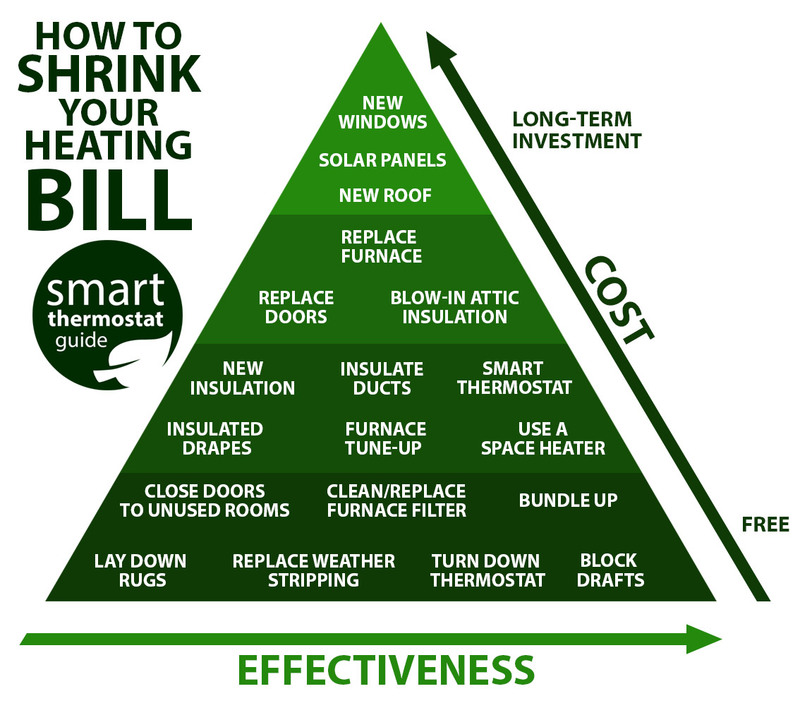 The home upgrades at the top of our Heat Savings Pyramid are costlier to implement ($1000+) and take longer to recoup the investment (a few years, minimum). Years of exposure to the elements causes your exterior doors to degrade. Wooden doors and frames warp, letting in drafts. If your doors are a few decades old, consider replacing them to save on energy costs and freshen up your home’s exterior appearance. The most energy efficient door choices are steel doors and fiberglass doors. How much bang you’ll get for your buck with a new furnace replacement depends a lot on the furnace you already have. Furnaces nowadays run at 90-97% efficiency – but if you’ve got an old one, it could be running at 75% efficiency or less. If your furnace is 20+ years old, you’ll definitely see a difference if you replace it – not just in operating costs but in improved circulation and a decreased likelihood of breakdown. A new furnace also helps when selling your home: potential buyers love new furnaces. If your furnace is under 10 years old, it’s probably in decent shape with another 10-15 years of life left in it. Unless it’s dead, hold off on this upgrade and, if you still want to splash out on a bigger investment, consider blow-in insulation or new doors. “Blow-in attic insulation” is a thick layer of fluffy cellulose material that sits on the “floor” of your attic, helping keep heat inside your house instead of escaping through the attic and roof. Professional blow-in insulation runs about $1100, depending on the material you choose (higher “R” value = better insulation but higher cost) and the size of your attic. As an anecdote, our 1977 home’s attic was barely insulated when we bought it in 2010. The upstairs was freezing cold our first winter here. The following winter we had blow-in insulation professionally installed and our upstairs floor became the warmest half of the house in the winter. Hold onto your hat – a typical residential 3kW solar array costs anywhere from $15,000-$30,000 to install – and that’s after federal rebates and other incentives are applied. Solar panels only make sense if you can afford the upfront cost, already spend a lot (say, $2,500+ annually) on energy costs, and you live in a sunny climate with a south-facing roof (assuming you’re north of the Equator). Solar panels are effective, though: solar panels can cut your energy bill anywhere from 50% to 90%. Most homeowners who go solar report recouping their investment within 4 to 8 years. If your roof is ancient, a new roof plus an insulated attic can make a big difference in your home’s heating and cooling costs. A “green” roof is a significant investment, though, so be sure that yours is worth replacing and look into available tax credits. The color of roofing material matters, too. In cool climates, a dark roof helps absorb and retain heat. In warm climates, get a light or white roof to deflect sunlight. New windows are dead last in this list because almost everything else on this list offers a better and faster return on investment. Just $1,000 worth of insulation, sealed air leaks, and window repair can offer the same savings as new windows. Replacing your windows is an expensive and messy project – in 2014, the typical cost to replace a single window just under $500 (source) before sales tax and contractor fees. Multiply $500 by however many windows your home has, and you’re looking at a significant chunk of cash. If you do install new windows, your energy savings will likely be modest: if you replace single-pane windows in a 2,000 sq. ft. home with tax-credit eligible windows, you can expect anywhere from $120-$450 a year in savings, according to the Efficient Windows Collaborative. Let’s try this with some real numbers: My home has 18 windows. Replacing them all would cost me about $10,000 ($9k for the windows, plus my region’s 9.5% sales tax). Even with the maximum estimated savings of $450 a year, it would take 22 years to break even on the installation cost. So when are new windows worth it? If your windows are 20+ years old, single pane, or just plain falling apart, new windows might make sense. But don’t rush into a new window project just for the energy savings – virtually everything else on this list can put cash back in your pocket for less. What is multistage heating and cooling and how do I tell if I have it?